The seemingly very basic business of maintaining a car fleet can, depending on needs and personalities involved, become startlingly complex. 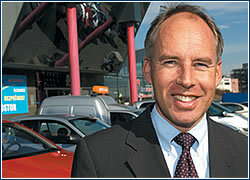 Mobile phone operator Eurotel also frets over the style in which its managers take to the road. 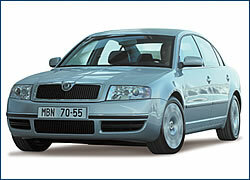 Eurotel spokesman Jan Kučmáš says that among a total management staff of roughly 50, lower-level management are awarded a Škoda Fabia, while middle-management get a Škoda Octavia, and top management may choose from an Audi, VW Passat, or Volvo. Škoda’s Superb, the only domestic Czech car that could be reasonably considered top-tier material, is also an option, though Kučmáš says it’s too early to tell how pervasive its popularity has become. One trend, however, is clear: top managers want diesel engines. Which makes perfect sense when one considers the fact that under Czech law a firm may provide its management with a car, but the manager must pay for petrol him- or herself (diesel petrol being decidedly cheaper). 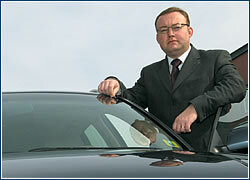 Of course, requirements for a corporate car fleet often go well past simply providing suitably luxurious transportation for management. So while Eurotel’s key decision-makers may choose from an array of quality imports, the firm on the whole maintains a fleet of over 500 vehicles, 90% of which are Škodas of the more utilitarian sort. These are used by technicians to get to the operator’s base stations in a timely way. Because disruptions in service at a station may be covered automatically by battery support, that support only lasts up to two hours. Having a car ready and able to get out to a base station within that window of time could mean the difference between service disruptions and smooth sailing. As the size and relative wealth of local firms grow, so too do the prospects for local suppliers like Mr. Olbrich. In fact, supplying corporate fleets already accounts for a significant chunk of the revenues of well-known importers. Volvo, for example, is famous for safety-conscious cars favored by the fusty and selective buyer who wants to part with a lot of money, but doesn’t necessarily want too much flash. The Swedish brand reports that corporate fleets account for roughly 10% of its revenues in the Czech Republic – a percentage similar to that reported by German brand Audi. 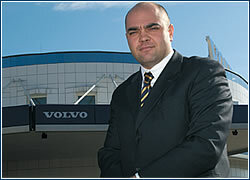 “Managers keep being more and more interested in Volvo,” says Volvo Czech Republic’s retail operations director, Jiří Filla. “Our clientele comes almost entirely from top management, and these people have a generally very clear idea about their priorities,” Filla claims, noting that key among these priorities is, as one might expect, safety. The messy business of tenders is a topic not easily broached with local auto suppliers. Reasons for this are clear enough: a company’s major purchases are a very subjective and highly sensitive business. Liška at Audi says, “they (tenders) are all very different, depending on the customer.” However, one clear possibility is that decisions are influenced by more than simply price or prestige. It may be more than a coincidence that a solidly Czech firm like Eurotel chooses to use a quintessentially Czech (though German-owned) brand, and that a French-owned bank like Komerční banka uses a French fleet. Cars for managers: The top five thousandACCORDING TO Automobile Importers Association (SDA) statistics, only about 5,000 Executive and Luxury class cars are sold per year, a mere 3.3% of the Czech market. The effect of these cars on a given brand’s image is increased by the purchase price, but also by their enhanced visibility in the world of the rich and powerful. The market is traditionally controlled by the respected German brands Mercedes-Benz, Audi, and BMW, with which French Peugeots and Swedish Volvos are keeping pace with relative success. 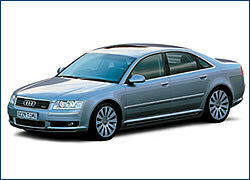 Since last year, the domestic-made Škoda Superb has been an exception. In 2002 the upper-mid-class (Executive) Superb asserted itself very powerfully: the 2,461 cars sold represented a more than 50% share of this segment (53.1%). The new Mercedes-Benz E class has also been very successful, as it came in second with over 400 cars sold (407), posting a significant lead over the traditional leader among imported cars of this class, the Audi A6, of which 345 were sold. 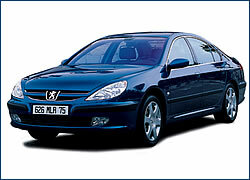 Not considering the very specific Audi Allroad Quattro station wagon (266 sold), the elegant Peugeot 607 took third place among typical manager cars, with 219 sold, outstripping the BMW 5 line (184 sold). 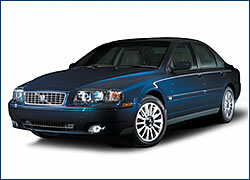 Only Swedish Volvo, with over 100 (115) S80 sedans sold, broke the 100 benchmark, but another of this brand’s successes last year was its V70 station wagon, with 190 sold. It is worth mentioning that less than 300 of the total 4,927 cars sold fall into the highest, Luxury class of sedans. Last year Audi was significantly slowed by the wait for the new A8 model, so it had to settle for third place, with 45 cars sold. BMW sold 130 top-flight 7 class cars last year (44.1% of this segment), and is offering a stretch version in addition to the standard model, driven by an powerful V12, 6-liter engine. 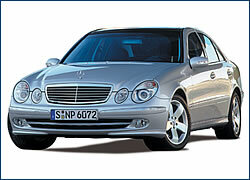 Also among the absolute elite is the S-class Mercedes-Benz: 106 were sold on the Czech market last year. Though PhIlip Aarsman defines operational leasing as providing the “feeling of owning a car without having to pay for it,” this may be overstating the case a bit. Of course through operational leasing, the popularity of which is rapidly growing, firms are freed from the every-day hassles of auto ownership including maintenance and repairs. Yet there is a cost. Aarsman, managing director of Business Lease, estimates that to fulfill obligations, his firm charges clients a monthly fee of roughly CZK 750 per car. Aarsman claims, however, that much of that cost is defrayed by other cost savings on things such as insurance premiums (covered) and substitution cars in case of damages (covered). Though Aarsman says that an overwhelming majority of his clients are multinationals with locations scattered around central Europe, the number of purely local firms starting to show interest is encouraging. This all, says Aarsman, is part of the broader trend toward increased outsourcing: “Companies have realized their main interest should be on their core business, not on support services… it’s like water from a tap, you don’t invest in it, you just use it.” While Business Lease offers a standard package to smaller companies not dissimilar to what they might get form a standard car rental company, firms with fleets of more than 10 to 20 cars receive a more tailored approach. The cost-aspect of operational leasing makes it easy to understand how people like Aarsman are finding their customer bases growing. Jaromir Hajek, managing director of LeasePlan, claims that the service he provides regularly saves 30% of the costs that a firm would incur with “in-house fleet management.” Business has taken such a positive turn, says Hajek, that his firm (now located in 26 different countries) will soon start peddling its leasing products in broader and more specialized categories – according to the number of services a client wants taken care of externally. 5.05 meters long, four-wheel drive. 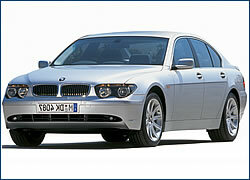 Gasoline engines: V8 3.7 l, 280 hp (206 kW); V8 4.2 l, 335 hp (246 kW). 4.87 meters long, front-wheel drive. Gasoline engines: 4R 2.2 l, 158 hp (116 kW); V6 3.0 l, 207 hp (152 kW). Turbodiesel: 4R 2.2 l, 133 hp (98 kW). 5.03 or 5.17 meters long, rear-wheel drive. Gasoline engines: 6R 3.0 l, 231 hp (170 kW); V8 3.6 l, 272 hp (200 kW), V8 4.4 l, 333 hp (245 kW); V12 6.0 l, 445 hp (327 kW). Turbodiesels: 6R 3.0 l, 218 hp (160 kW); V8 3.9 l, 258 hp (190 kW). 4.80 meters long, front-wheel drive. Gasoline engines: 4R 2.0 l, 115 hp (85 kW); 4R 1.8 l Turbo, 150 hp (110 kW); V6 2.8 l, 193 hp (142 kW). Turbodiesels: 4R 1.9 l TDI, 101 and 130 hp (74 and 96 kW); V6 2.5 l TDI, 155 hp (114 kW). 4.82 meters long, front-wheel drive. Gasoline engines: 5R 2.4 l, 140 and 170 hp (103 and 125 kW); 5R 2.0 l Turbo, 180 hp (132 kW); 5R 2. 4 l Turbo, 200 hp (147 kW); 6R 2.9 l, 196 hp (144 kW), 6R 2.8 l Turbo, 272 hp (200 kW). Turbodiesel: 5R 2.4 l, 163 hp (120 kW).